Eagles are birds of prey that have large wingspans and strong muscular legs. They also have very good eyesight. There are several species of this bird and most of them are distributed in Africa and Eurasia. With their relatively large wingspans, they are able to fly very fast on straight paths. Therefore, they are able to hunt their prey very effectively. They also have heavy beaks that will help them attack their prey. A large bird of this species could easily weigh 6 to 7 Kg. It has been found that the eyesight of some of the eagles is 3.6 times better than humans. The large pupils of their eyes contribute a lot to this effect. It enables them to see their prey from a long distance. Normally, these birds choose elevated places to build their nests. The female bird which is larger than the male will lay two eggs. When one egg hatches the young bird will wait for the other to hatch and will kill it. Even the mother will not prevent it. This means only the strongest eagles will survive and the population of birds will be under control. It has been found that eagles are among the largest of the birds of prey. However, there is no way to find the largest eagle for the simple reason that the heaviest one is not the one that has the biggest wingspan. 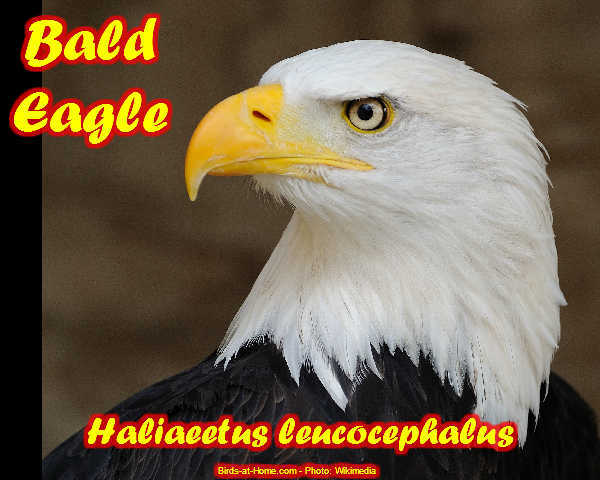 The heaviest is the Steller's sea eagle and the one that has the largest wingspan is the Philippine eagle. While the wingspan of a Philippine eagle could be 100 ft the weight of a Steller's sea eagle could be 15 pounds. The smallest of the eagles is the Great Nicobar Serpent-eagle. Its habitat is the forests in the South Nicobar Islands. The weight of one of these birds is just 1 pound. Due to loss of habitat, it is dwindling in numbers and is threatened species. It is the different lifestyles of these birds that decide their wingspans. Generally, the birds that inhabit forests have smaller wingspans. Birds of this species that live in open areas have relatively longer wingspans. Only a very few species of birds of prey are larger than eagles with either wingspan or the weight. Condor is one of them. Also, there are a few other vultures that are larger than these birds of prey. They are majestic birds when they are on a flight. The American Bald Eagle is the only eagle which is native to North America and it's only on its native continent that one may find it. Alaska, the 49th State admitted to the Union, is home to about 35,000 of the 70,000 total population. British Columbia boasts about 20,000, and the rest predominantly inhabit the Pacific coastline, with a few scattered throughout the rest of the United States. The population is heaviest in the Pacific Northwest due, in part, to a large amount of salmon found there. Eagles depend greatly on fish as the main part of their diets. They will eat small animals such as mice, rabbits, muskrats, duck and snakes and they will resort to eating carrion (dead animals), if necessary. However, they prefer that their food is a fresh source and they are partial to fish. While Bald Eagles are capable of carrying their food in flight, they can actually only lift about half of their body weight. Although they can dive, catch fish in the water, and swim to shore with them, they have also been known to drown if the fish is too big and they don't let go of it. In level flight, the Bald Eagle has been recorded at speeds up to 44 miles per hour (70.1 km/h). It can dive (and has been clocked) at speeds of 75 to 100 mph (120.68 to 160.39 km/h). The eagle is capable of riding the thermal air currents in excess of 10000 feet (3048 meters) and can stay aloft doing this for hours at a time. In February of 2006, an announcement was made that the USFWS had issued guidelines on how the species should be protected by landowners and others, once the bird is no longer listed as a threatened species. Those guidelines include proposals for laws which prohibit disrupting the bird's breeding, sheltering, or feeding practices or disturbing it in any manner which could cause injury, death, or nest abandonment. Should those proposals be solidified and approved, it could lead to the removal of the Bald Eagle from the "threatened" list.